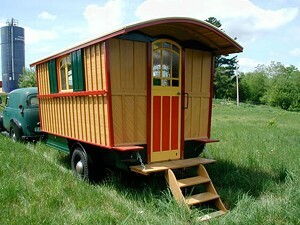 Joe Nusbaum wasn’t planning to become a gypsy last January, when he started building a mobile domicile in his backyard. The Homeland Security policy writer, who has no architectural background, drew up a plan based on living spaces he had seen in a Chelsea Green Publishing book called Freewheeling Homes, including several built by Corinth resident Dan Wing. The result is technically called a “vardo,” but most people would identify it as a gypsy caravan. Nusbaum describes the still-unfurnished dwelling as “about the size of a walk-in closet.” It feels more spacious, partly because of the angled walls, which make the 10-foot-long trailer 5 feet wide at the bottom but more than 8 feet at the top. A barrel ceiling adds to the roominess. When it comes to construction, Nusbaum admits, “It’s learning as you go.” The self-starter has gone far beyond the basics, however. Take the stained-glass windows. Nusbaum made them himself, inspired by the rosemaling (a Scandinavian floral decorative technique) on a trunk painted by his Norwegian grandmother. Nusbaum plans to move into the vardo by July 11, when he and his boyfriend will take it on its maiden voyage to Provincetown. Once back in Vermont, Nusbaum has plenty of offers for parking places. “The good thing about this is, since it’s so nonintrusive, I have plenty of friends saying, ‘Stay with us, stay with us,’” he says.